On Friday Keith Woodard and Luis Vilella left the shop behind to staff a table at the Expo. This year’s event was for 6th-8th grade girls and gave them the opportunity to take part in hands-on activities designed to help increase their interest in the STEM fields. Keith and Luis demonstrated how CNC machining works, how to read a blueprint and they showed the girls a wide variety of cool machined parts. 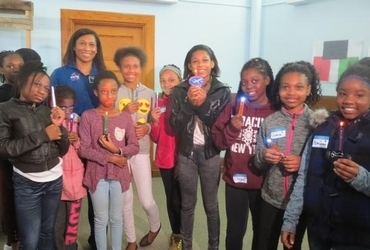 The keynote address was from Corcoran alumna and NASA Astronaut Dr. Jeanette Epps, who spoke about what she does at NASA, why it’s important and how the young girls can follow in her footsteps.